NFTO’s Ian Bibby and Team Giordana Triton’s Nicola Juniper have been crowned champions at the 2015 British Cycling National Circuit Race Championships in Barnsley. Bibby, 28, attacked with two laps to go and showed his strength to hold off the chasing pack in Yorkshire while in the women’s race Juniper sprinted to victory on the final climb from a select group. "To be honest it is a bit unexpected really,” Bibby said. “I have not won a crit this year but it was quite a hard circuit of climbing and I thought I would bide my time and leave it late. “It's a really good time to win, I've won cyclo-cross and mountain bike before so to get one on the road, really happy." Juniper, winner of the British Cycling Women’s Road Series, said: “I didn't know how I'd fare on the hill but I had a bit of a gap and just went for it, head down." On wearing the British champion’s jersey, she added: “So excited, my first stripes as a senior, I got the masters old girls' jersey last year but it feels really good to get this one." Pedal Heaven’s Stephen Williams broke away in the first major move of the men’s race on a technical circuit in Barnsley and stretched his lead to five seconds. 100ME%'s Matt Gibson and NFTO's James Lowsley-Williams emerged from the front of the bunch as they aimed to close Williams down but were themselves passed as Bibby, Alex Paton and Kristian House joined the Pedal Heaven rider. Further riders bridged the gap before Bibby made the decisive move and attacked on the climb towards the finish line. One Pro Cycling’s George Atkins took up the chase on the front but it was to no avail as Bibby, a former British champion in cross-country mountain biking and cyclo-cross, claimed a memorable win. JLT Condor’s Graham Briggs took silver with George Atkins third. Earlier in the evening Juniper proved to be the protagonist as rain made the Barnsley circuit even more challenging. 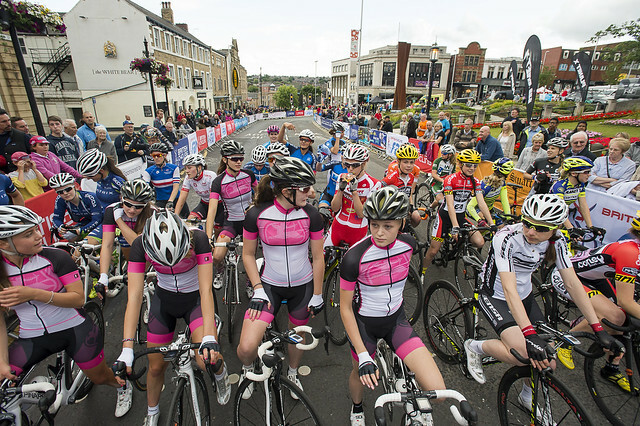 In an early move which split the women’s race, a group of nine riders pulled free including Juniper’s teammates Annasley Park, Grace Garner and Abby-Mae Parkinson as well as defending champion Eileen Roe (Wiggle Honda) and her teammate Amy Roberts. Wiggle Honda’s Amy Roberts was unable to open up a significant gap over her rivals despite persistent attempts as Giordana Triton made their numbers count at the head of the race. The group was whittled down before Roe made the first move on the last climb to the finish, before Juniper quickly joined and passed her. Roe valiantly tried to claw the gap back but Juniper held firm to celebrate across the line and continue her fine season with a British title. Roe had to settle for silver with Amy Roberts completing the podium with bronze.